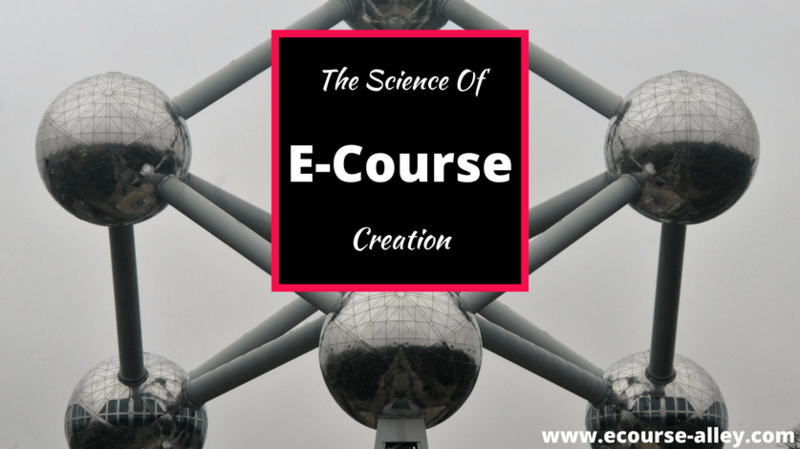 I know what you may be thinking, how can there be science involved with e-course creation? Well, scientific procedures and theories are involved in a lot of things we do in life, whether we realize it or not. Coming from a science, education and instructional design background, I thought that I would share with you my expertise in this area and how I apply the Scientific Method to my business endeavors. Every time we create an info-product, it is like doing an experiment. Okay. So the Scientific Method, just the basics, goes something like what the info-graphic below shows. Now that you can see the basic progression from the statement of the problem down to the conclusion and what can be done in the future, based on the results of an experiment, you may be able to deduce where I am going with this next! Every time we create an info-product, it is like doing an experiment. We don't know yet if it will be a success or not. This is why doing a mini-experiment by pre-selling your e-course before you create ALL the content is so important. However, you won't know until you have created the final product and put it out into the world as a full-fledged experiment of your e-course info-product if you will get the results you want (sales + positive feedback). You also won't know if you will be able to draw positive conclusions about what you did and use it to build your next e-course in the future (your future work). Therefore, I'm going to walk you through the thought process of how to apply the Scientific Method to e-course creation. The first step, naturally, is to identify the purpose of what you want to teach your audience and why you want to do it. What is the "pain" or problem that you want to solve for your audience? Also, consider what you are passionate about teaching and what areas of expertise you have to offer. This will help determine what niche is right for you to best serve your audience. What is the "pain" or problem that you want to solve for your audience? For example, I have extensive experience and training in instructional design and e-learning and I am passionate about these topics, so it is natural for me to want to offer my expertise and share my experiences and knowledge about creating and selling e-courses. There are numerous "pains" and problems that one can encounter in this field, and therefore, I can offer solutions, strategies and suggestions for how to overcome such obstacles with my knowledge and experience. How do you go about discovering your audience's pain or problem? Well, this is something that may require either researching your niche and discovering the main obstacles facing those involved, or simply asking your audience (if you have one established already). Let's look at an example scenario as I guide you through the steps in the Scientific Method. Our example will be my Popcorn Analogy. This analogy deals with the making of stove-top popcorn. Let's say we did some research to start with by reading some forums and blog posts (and/or asked our audience if we had one) and discovered that people were frustrated by having more than 5 unpopped kernels in their home-made, stove-top popcorn. Therefore, this becomes the pain or problem that we want to solve. The purpose for our experiment may then look like this: To develop strategies to pop corn kernels more efficiently so that there are only 5 or fewer kernels left unpopped at the bottom of the pan. Next, we will develop a hypothesis or "what we think will happen" during our experiment to try to solve this problem. Develop a what? A hypothesis. What is a hypothesis? Well, that is a very good question, a hypothesis is just a fancier way of saying, "What do you think the outcome of your experiment will be?" So, you will need to come up with a hypothesis or how you think you will be able to solve your audience's pain or problem and what the outcome will be. In order to develop a sound hypothesis, you may need to conduct some research. Or, if you have a following already, I would suggest you ask your audience or conduct a survey to find out what they want to learn or what they need to learn in order to solve their problem or pain. Now let's go back to the Popcorn Analogy. What do you think will happen during your experiment(s) using varying amounts of kernels, oil and heat? Your hypothesis could go something like this: I think that by adjusting both the ratio of kernels to oil and the heat setting that I will be able to consistently have no more than 5 unpopped kernels in every batch of popcorn. Since this is just an analogy, I won't go into details of exactly what ratio of kernels to oil to heat that would be in a hypothesis, but you would have to be more specific. Now it is time for the fun to begin - your experiment(s). It is time to take action! You should test your idea before spending several hours creating your course. You are now at the step to try out your course content and design on your audience. You might want to start out by pre-selling your course first, which you can do before you even finish the course content. The reason why it is a good idea to do this, just reinforces the science involved in creating info-products like e-courses. You should test your idea before spending several hours creating your course. So, if you pre-sell it, it is like doing an initial experiment. If you receive positive results from this, then you will feel more secure and confident to go ahead and finish your e-course and then do the real experiment of selling the final product. You could also perform a few simultaneous experiments such as pre-selling your course in different ways using different social media platforms and then see which ones perform better. This is called A/B split testing. There is a whole lot of experimentation in this business! Again, looking at our Popcorn Analogy, we will need to conduct experiments taking into account our hypothesis that we will try different ratios of kernels to oil, and experiment with the heat setting, etc. and then measure the amount of kernels left over after each experiment. Note that I'm not going to go into the details of an actual experiment with popcorn, but you get the idea. Making observations may seem like the logical next step, but even so, it is very important to talk about because making the right observations is the key to success. In other words, observe what is working and what is not working with your "experiment." Was your marketing strategy successful? Did your audience comment on anything to give you a clue as to your experiment's success? Making the right observations is the key to success. Depending on your exact experiment, this could vary somewhat but you should look at the number of subscribers, sales, leads, etc. that you get during a set period of time. Also, if you are able to A/B split test your info-product, see which version of your experiment performs better during the time period you choose (one month, two months, etc). Bonus tip: I wouldn't suggest making conclusive observations based on a time period of less than a month. Less than a month is not really enough time to have your experiment out in the world and be able to conclusively state if it was a success or not. If you use images or are testing different email marketing strategies, look at which ones are converting the best. Note that the word "converting" is just jargon for getting email sign-ups to your opt-in freebie, e-course or newsletter, for example, in hopes of ultimately converting your audience member to someone who will buy your e-course. Observe if you receive comments about your experiment. I would suggest including opportunities for your audience to comment wherever you can. Feedback is very important to your success. You need to listen to your audience and strive to continuously improve your business. Not only do you want to observe if you receive any comments, you want to observe what they say and how many are positive, how many provide constructive feedback and how many (hopefully not!) are negative toward your experiment. BONUS TIP: Don't fret if you do receive negative feedback. There is actually a silver lining to this: it is better than hearing just "crickets" and it helps you to know what your audience doesn't like. You can then use this feedback to your advantage and re-do your experiment. Then hopefully the next time around your feedback will be even better! Looking at our Popcorn Analogy again, observe which experiments yielded a lower amount of kernels left unpopped at the bottom of the pan. These kinds of observations would point to the more successful experiments and thus be the ones you would want to try to repeat to have favorable results. At this step of the Scientific Method, you will or should record the observations you made in the previous step. These are your results - what resulted from your business experiment. You want to know what NOT to do again just as much as you want to know what to repeat. Maybe you are thinking, "I made a mental note of the observations and I have no time to actually physically record all the results," and I get it, but it is VERY important to write it down. Why? Well because later it will be hard to remember clearly all that you did within an "experiment" and even if it didn't succeed, you want to know what NOT to do again just as much as you want to know what to repeat. To make your life a little easier, I will help you out with the recording bit by providing you with guidance on what to record (hint: it is similar to what you observed at a high level in the previous section, but now you will write down some of the details). I will also offer you my free template that you can grab below. It is a basic spreadsheet that should help you record your results so that you have something concrete to look at. This way, you should be able to reproduce what succeeded in your experiment, know where to tweak your process in the future and continuously improve so that you can become even more successful. To grab your FREE Results Template, sign up below to get access to the ECA FREE Resource Library. Okay, back to talking about recording your results! You may also be wondering two other things: what exactly do you record and how do you record it so that it is organized, makes sense, and is easy to do? Well, the answers to these questions are what I will show you next. Which experiment got more subscribers if you A/B split tested a free opt-in, info-product or different Pinterest pins, etc. How many comments you received about an opt-in, an e-course, etc. Out of the comments you received, which were positive? Which were negative? What were some comments that made an impact, i.e. did they ask for help or offer a suggestion of some other content you could produce or provide feedback on how you could improve something? Now, I want to talk a bit more about the template I created for you using Excel. The template is customizable so that you can modify it to fit with whatever experiment you performed. Therefore, you can add to the spreadsheet and create your own column titles as you go along. But hopefully this will get you started. Again, to get this free template just sign up to gain access to my free resource library (you will be sent a password) and then you will also, as a BONUS, have access to my exclusive ECA Workbook as well as other templates to help you plan, organize and execute your e-course business with success. Okay so back to our analogy. Record your popcorn making results in a spreadsheet similar to what I just described. What you will want to do is to document the variables that can affect the outcome of your experiment. So, in this example that would mean documenting the temperature setting you had on the stove, the amount of kernels and the amount of oil you used in the pan. Then, you wold write down the outcome by counting the number of kernels you had left in your pan at the end for each of the different situations. In this analogy, we are assuming that you would be testing different scenarios, and this is also something that would apply to an e-course business as well, you need to test different ways of doing things and find out what works best for you and your business. Then, if you find that a certain combination of temperature, oil and kernels seems to yield the desired result (no more than 5 unpopped kernels at the bottom of the pan), then you would want to see if you can reproduce this. So you would also want to record the result for any of the trials you do in trying to reproduce the favorable result you got in your first set of experiments. This is how you grow your business! Once you find out what works, you try to keep reproducing it over an over again, tweaking it here an there of course and improving it, but the basic skeleton of your initial experiment is still there! We are finally here, the step where you will take everything you did, everything you learned, everything you observed, and everything you recorded as results of your experiment and draw some conclusions. You can then add this rating system to your Results spreadsheet (as you will see I have done for you already in the Results Template I shared with you earlier from my resource library). Look for clues in the feedback you received from your audience. Next, after you have determined if your experiment succeeded or not, decide if you would reproduce it for your next e-course creation endeavor or for your free opt-in. If it didn't fully succeed or failed (hopefully not! ), then how would you improve it in the future? What would you do differently? You can look for clues in the feedback you received from your audience or you can consult experts in the e-course creation field (like me :)) to find out where you went wrong. Drawing conclusions from your e-course creation experiment leads naturally to the last step....Future Work. Let's go back to our popcorn analogy now. Since this is just a thought experiment in order to show you how you can apply the Scientific Method at each step, I will just talk hypothetically about conclusions that could be drawn from such an experiment. For example, when the ratio of kernels to oil was one to one and the temperature was at medium heat, only about 4 or 5 unpopped kernels were consistently left at the bottom of the pan. From these results, we could conclude that this combination of variables solved our audience's "pain" and is therefore the method that we want to continue to use to make popcorn. Simply put, by drawing conclusions based on your results, you can now draft a list of tasks, new e-courses, improvements to your process, etc. that you will tackle for your next e-course launch, pre-sale, opt-in freebie, email marketing campaign, or whichever stage you are at in your e-course business. If you continue to experiment and improve on your methods you will find success! Again, you can add Future Work as another column in your Results Template. You will see I have included this for you as well in the template I created in the resource library. And....since we are now at the final step in the process, I have created the info-graphic below to help you visualize the main steps of the Scientific Method. Follow these steps with your marketing campaigns and e-course launches and I guarantee you that it will make things easier for you in the long run and help your business grow. Our last look at our popcorn analogy: decide what you will do in the future when making popcorn. Will you continue to make popcorn the same way that you found worked in your experiment and solved your audience's problem, or will you try to improve the production even further? There is a whole ocean of possibilities out there but if you continue to experiment and improve on your methods you will find success! I hope you can now see how the Scientific Method can be applied to your e-course creation business and I hope this information is of value to you. Again, here is the sign-up form so that you don't miss out on the Results Template I uploaded to my Free Resource Library. Remember once you sign up you also gain access to everything I share in the library, which will continue to grow. I’ve been wondering about some of this myself. Not set on a final decision yet, however this has definitely delivered some information.